'Epanteris' the giant allosaurs specimen. It's a bit bulky but it was a big animal. I wanted to enclude these in yesterdays post but my signal wasn't good enough to upload after the first image. Damn wind! 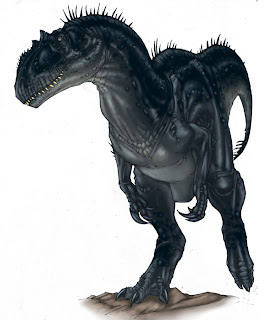 This one is sort of a revamp of the male Allosaurus in the last post. Since that one was based off of Paul's Allosaurus fragilis skeletal reconstruction in PDoW, I thought I'd draw one based off of the Allosaurs atrox reconstruction in the same book. Jess nicknamed this one Fluffy right after it was drawn, the feathers are entirely speculative and more than likely wrong, but it is a fun picture. This one as well as the family from the last post were colored by my wife Jess. 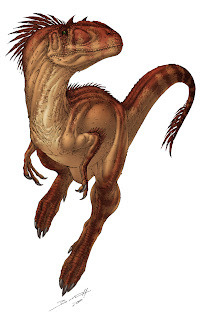 It's good that you put protofeathers on, especially since that new discovery of an ornithischian being found with them! Erin, we only have it because there are no phone lines out here, but it does work well when it's calm, it's just not a fast as the land line stuff since it has to go to a satellite and back. but it's better than nothing! I was completely floored by the feathered ornithischian, totally unexpected but very cool! These are all fantastic! I know that you did this a little while ago but still, simply beautiful!